The ZIP file archiving and extracting algorithm was released to the public domain by its inventor Phil Katz in January 1989. Nico Mak Computing tried to make a buck off it by slapping a graphical user interface on it on and selling it as shareware. I've used WinZip for many years, but as I noted more and more aggressive money grabbing tactics associated with it, I avoided upgrading to the latest version. Now, I've heard that when you install WinZip it sneaks Uniblue Registry Booster and the Google Desktop and Toolbar past you. WinZip costs $29.95 to register after a 45-day trial. You can get the full version free if you complete a TrialPay offer. No thank you - it's time to dump WinZip. 7-Zip is a free open source archiving and extracting tool with a graphical user interface that works with Windows 98/ME/NT/2000/XP/Vista. There's a command line version that works with Linux/Unix. 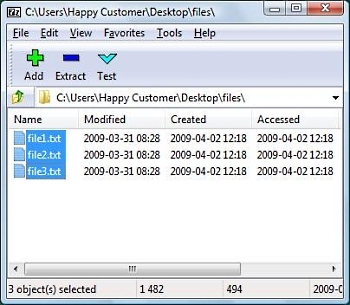 You can use 7-Zip on any computer, multiple computers, even for commercial use. 1. go to 7-zip.org and click on the download link for .exe to download the setup program to your desktop. 2. double-click on the setup program icon to start 7-zip setup. 3. Setup displays c:\Program files\7-zip as destination folder. Click on the [Install] button. 4. After a second the setup programs displays the "Completing Setup" message. Click on the [Finish] button. The setup program does not put an icon on your desktop. If you desire a desktop icon, in Windows File Manager, navigate to the folder c:\Program files\7-zip and drag a 7-zip file manager (7zFM.exe) shortcut to your desk top. 1. Open the 7-zip file manager and, using the address bar, navigate to the folder containing the files that you want to place in the archive.